Opening Times: Open daily at 10am to 6pm. 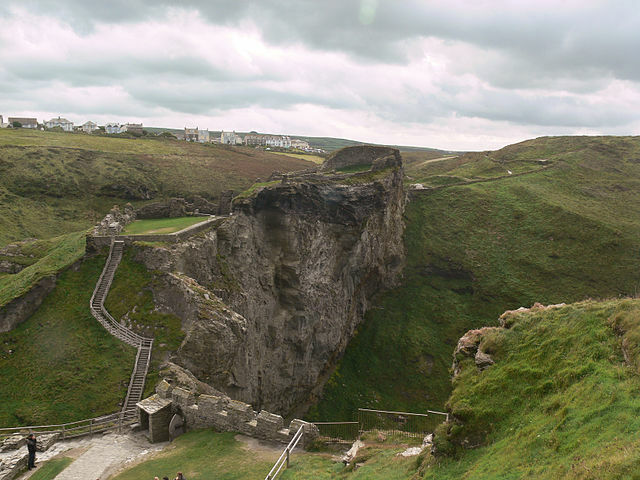 Notes: Tintagel Castle (Cornish: Dintagel, meaning "fort of the constriction") is a medieval fortification located on the peninsula of Tintagel Island, adjacent to the village of Tintagel in Cornwall, England, in the United Kingdom. The site was possibly occupied in the Romano-British period, as an array of artefacts dating to this period have been found on the peninsula, but as yet no Roman era structure has been proven to have existed there. It subsequently saw settlement during the Early Medieval period, when it was probably one of the seasonal residences of the regional king of Dumnonia. In the 13th century, during the Later Medieval period, after Cornwall had been subsumed into the kingdom of England, a castle was built on the site by Richard, Earl of Cornwall, which later fell into disrepair and ruin.